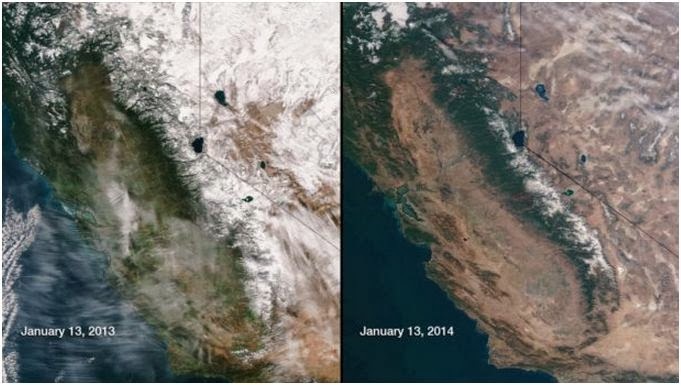 By now, many of you have undoubtedly seen some version of these NASA images that compare snow cover in California between 2013 and 2014. Believe it or not, 2013 was considered a drought year (as was 2012), so you can only imagine the visceral reaction these images have brought up over the past couple of weeks, released on the heels of the news that 2013 was the driest year ever recorded in the state. With barely a drop of rain so far in 2014, who knows what is on the horizon. Many people are asking what makes this drought any different from other years; California has experienced major droughts before. And there are many good answers out there to these questions - they have to do with things like where and how the state's population is growing, groundwater depletion, and the wide-scale change in agriculture from annual crops, which don't have to be planted in dry years, to permanent crops like trees and vines that are economically attractive but need some consistent water to stay alive. Even living in different parts of the state may give a different sense of how bad things are - southern California doesn't receive a lot of precipitation overall anyway, but those of us in northern California are more likely to be used to January's filled with endless rain and flooding, not wildfires. What I want to explore here though is why this drought seems to *feel* different. From "The emotional toll of drought," a beautiful meditation by farmer and rancher Dan Macon on the very real and immediate decisions he is making about letting go of his animals, to Mark Morford's "Fine weather for creepy melancholia," which describes *knowing* "something is wrong" in your bones, to a very short but powerful Grist post that simply ends with the statement "Enjoy your sunny weather, Californians! Because we are clearly all gonna die," I'd say there are a lot of deep feelings out there. We are living in not only a physically altered landscape, but an emotionally altered one as well. I think much of that has to do with the climate change context; it feels to me like a lot of us are collectively holding our breath and wondering "Is this it? Is this how it's going to be?" One of the more interesting things to me has been that by far the most popular and widely-shared drought-related science story we've seen has been Berkeley professor Lynn Ingram's research exploring whether this is the driest the state has been in 500 years. I am curious about why this piece of research has spread so quickly. It is undoubtedly extremely interesting but, as we all know, many research projects are. What is it about this one at this time? Is it because it's fun to say "paleoclimate?" Is it because thinking this has happened before is comforting? My sense is that it does provide some larger perspective, though what that is probably varies widely from person to person. Much of my job these days is spent trying to organize and help provide resources about drought for journalists, farmers, ranchers, homeowners... whoever needs it. I am grateful to work for an organization that can be of service on this issue and has more than risen to the occasion in a totally emergent and fully cooperative way - it's really pretty amazing to be a part of. Having worked for many years on wildfire issues in California, it has become second nature to me to deal in "crisis science communication" - to rally all our informational and human resources, develop websites, put together media contact lists, be responsive, coordinate with colleagues, and jump in wherever there is a need. And yes, big parts of my days are spent live tweeting this slow moving natural disaster. What that means is trying to make sense out of the social, political, economic, and environmental context - from water transfers to vast increases in digging deeper and deeper wells to disagreements about who deserves what water and when. There are trees and sheep and cattle and birds and fish and wildlife to think about. There are already vulnerable people that are losing jobs and probably homes and what little security they have. There are people with money making more. There are groups that worry about short-term damage, while others claim the drought mostly to be important only in a bigger, longer-term picture. And, in the midst of this is a lot of beauty, there are tons of people trying to help - to distribute emergency funds, to make limited resources go further, to witness. This is the part you don't learn in school, that part of your job as a scientist and communicator is to try to hold all of it - the apocalyptic images, the daily news, the research results, the busy-ness, the logistics, the coordination - and still to contribute. But what is it that we contribute? I have had and continue to have mixed feelings about perpetuating "bad" news -- to adding to the endless sense that we are doomed. So I work to provide some balance between the reality of the situation and the good stuff - the pragmatic things that can be done now and uplifting stories like those of almond farmer Tom Rogers who has managed to reduce water use and increase his yields, while generously sharing what he learns. I vacillate between overwhelmed breathlessness and the adrenaline rushes of excitement about both all that needs to be done and all the cooperation that I see, the service offered without asking. My body pays the price - I don't eat and then overeat, I forget to go to the bathroom, it turns dark outside and I realize I've not moved for hours. And, that can't be right. That very inability to take care of myself is a personal symptom of the larger problem. I try to remind myself of that, but often fail to change anything. Well said Faith. I am right with you, in the dilemma of panic vs. overreaction vs. need to shout from the rooftops vs. uncertainty vs. depth of emotion. Climate change is a wild ride personally, politically, globally. How do we make sense of it all. Can we, before its too late? Is it already too late? What does too late mean? Yes, these are the big, critical questions we're trying to navigate. It feels both surreal and all too real, all at the same time. Thanks for reading Deb. One of the things I found so interesting in the Dan Macon piece I referenced in the post was his taking comfort in reading and watching stories of Dust Bowl survival, how that helps him to keep things in perspective. And of course it made me wonder what I take comfort in - who my precursors are? What stories would help us to make sense? Scientist and communications practitioner writing about water, and about what taking a more relational, people-centered approach to environmental work might look like. For my bio and writing, or to connect on Twitter, click the links below. © Faith Kearns, 2013-16. Unauthorized use and/or duplication of this material without permission from blog owner is strictly prohibited. Excerpts and links may be used, provided that credit is given with direction to the original content.